While the Houston Rockets and the Golden State Warriors ran roughshod in the NBA regular season and playoffs, the teams that they beat en route to the Western Conference Finals exceeded expectations and weren't supposed to be competing in the semifinals in the first place. 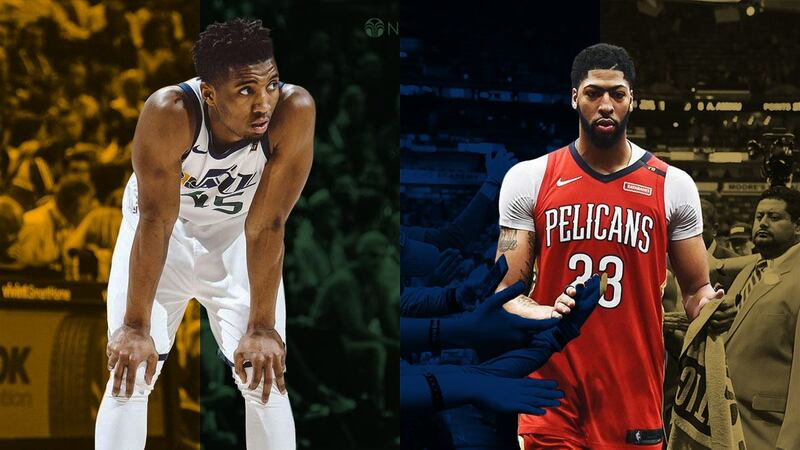 The Utah Jazz and the New Orleans Pelicans both fell 4-1 in their respective series against the best of the West, but both should hold their heads up high for getting to that point and can reasonably believe that with a few tweaks to their respective rosters, they could challenge the upper echelon of the conference next time around. Losing your star player from the previous season shouldn't lead to an appearance in the semis, especially in the West. Leaning on a rookie as your go-to option on offense shouldn't have been a recipe to a playoff run, which was only stopped by the top seed. Starting 19-28 was far from ideal. But the Jazz wasn't about the "should nots." They just went and earned all they were "shouldn't" have accomplished. Utah fell to the Atlanta Hawks—last place in the East—on January 5. With Rudy Gobert returning, they went and torched the league with a 29-6 record to finish the year. Led by 13th overall pick Donovan Mitchell, the Jazz had an offensive rating of 108.4—middle of the pack, but considering they lost Gordon Hayward, it was impressive nonetheless. Their defense, however, was second-best in the league (103.9). The team smothered the opponent with discipline, the "Stifle Tower" patrolling the paint and perimeter pests Joe Ingles and Ricky Rubio busting their asses off. If they believe Derrick Favors can continue to play alongside Gobert, and coach Quinn Snyder can sustain an offense around the two bigs then they should try re-signing the former. The thing is, the league is now veering away from these lineups and keeping him compromises their spacing because both he and Gobert can’t space the floor. The best role for Favors would be as the anchor of the second unit, but he shouldn't be paid more than the $12 million he made last season to fill that role. The hardworking pivot won't be without suitors (Hello, Dallas), so the Jazz could have themselves pushed out of the market anyway. Dante Exum is a former fifth round pick and was supposed to be a promising prospect with small forward size, point guard skills, and athleticism for days. However, he hasn't made good on his potential. Due to injuries or simply not being as good a player as advertised, he has been a disappointment so far. Utah would be better off admitting their mistake of drafting him. The Jazz should embrace the 3-and-D philosophy. Look at the Boston Celtics, they have an abundance of interchangeable wings that all shoot. Utah has pretty much the same makeup as the Boston Celtics. They already have Crowder, Ingles, and the returning Thabo Sefolosha, yet should look to add more to surround Mitchell and Gobert. Despite losing DeMarcus Cousins halfway through the season, Anthony Davis went full supernova on the league. With The Brow at the 5 surrounded by shooters, the Pels swept their first-round matchup with the Portland Trail Blazers, but ran against a brick wall in the Warriors during the semis. Normally, the loss of a player like Cousins would've meant that his team is automatically out of contention, but they didn't falter and instead drew inspired play from the aforementioned Davis, Jrue Holiday, "Playoff" Rajon Rondo, and Nikola Mirotic. With Davis inside the paint, New Orleans suddenly had a spaced-oriented system that tactician Alvin Gentry specializes in, as a former assistant coach for Golden State. We know it may seem like a mistake to re-sign Cousins, but there's no way they should let him go for the simple reason that they won't be able to replace him. Aside from not having enough cap space, he's still a top player in the league so they should keep him, plain and simple. Marksmanship is the lifeblood of an NBA offense nowadays, and while the Pelicans have ample of it, they don't have anyone whom defenders can't leave wide open such as a JJ Redick or a Kyle Korver. Whether through the draft, free agency, or trade, they need to find their own knockdown sniper. Any wing, please, and preferably more than two. The perimeter players that the the Pelicans currently have are either too small or too slow. Jrue Holiday, at 6'4", guarded Kevin Durant, who is at least seven inches taller than him. Someone in the mold of Otto Porter would be perfect.